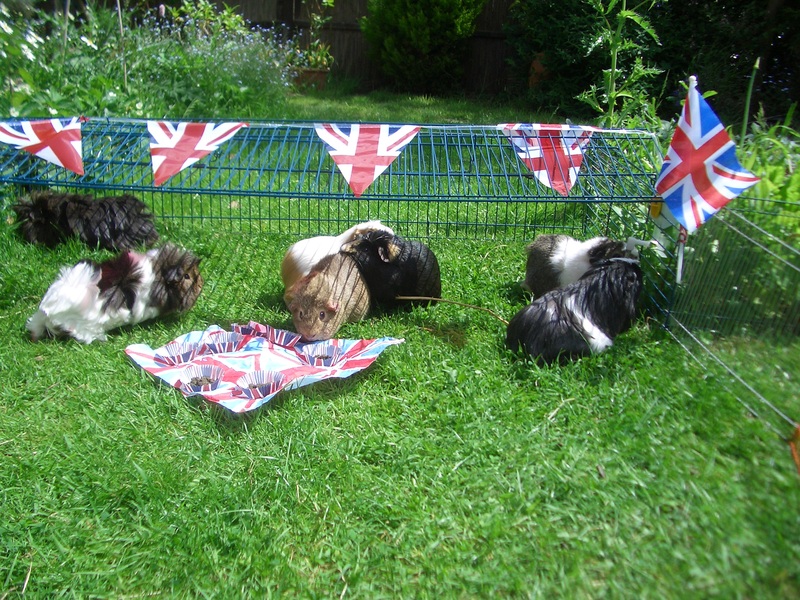 The Magnificent Seven had a party in the park today! It was great! 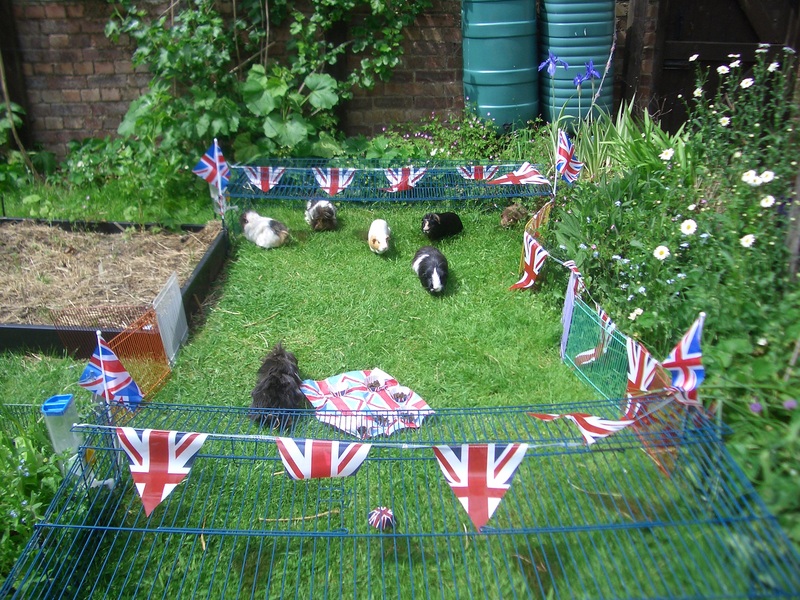 Mummy went out early and made a lovely arena for us, with flags flying all around and pretty things flapping in the breeze. The sun was shining, the birds were singing, and we had some lovely mini-cakes to eat. It was all to celebrate the Diamond Jubilee of our Glorious Queen Elizabeth II. (Victor said to put that in). I was very good, but Kevin got a little over-excited and ran round jumping on all the uncles, even his friend Colman. Colman couldnt believe his eyes when he saw the cakes. I saw him eat at least two of them. Well, they were very nice, but Humphrey and I found a bit of celery growing just next to the water bottle. That didnt last long! Mummy came and sat in the arena with us so we ran around her and under her legs. She made a nice sunshade. We had a lovely time and I enjoyed myself tremendously. This is the arena when we were all thinking about having a bit of grass and then a rest. Then Mummy put Colman & Kevin’s run together properly (it was there all the time but not joined up) and put the shade things over and we settled down for a bit of lawn-mowing and snoozing in the shade. Mummy says it will rain tomorrow so make the most of it. She also made some moving pictures and she says she’ll put them up sometime too. This had me in giggles!!! So cute and funny. 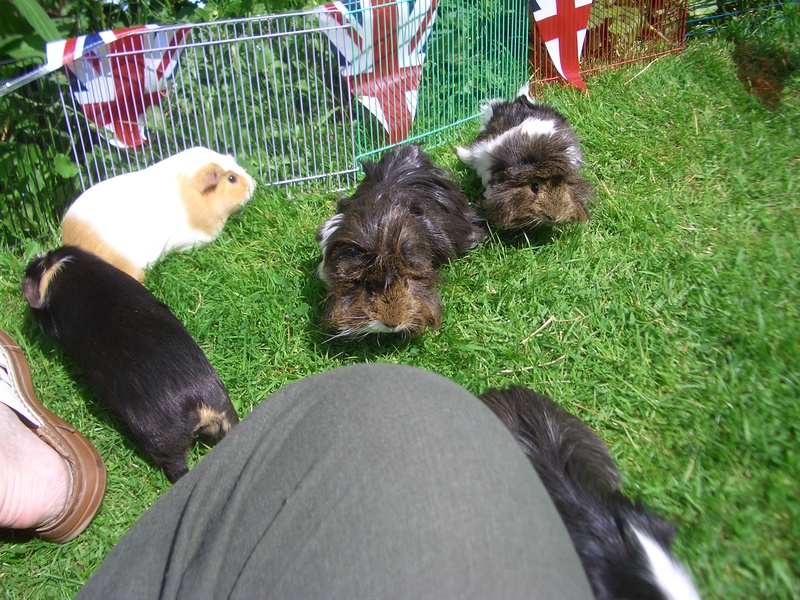 Such lucky guinea pigs! I'm also happy that you seven are getting along so well. Where I live, we don't have a king or queen, so we don't get a Jubilee. We did have a Bicentennial to celebrate our nation's 200th birthday, but I was just a wee thing and don't remember much of it. Imagine something that happened in the first few weeks of your life, Dyl — you wouldn't have much of a recollection of it. Have a wonderful Jubilee week, boys!! You look like you had great fun. Whee didn’t have the sunshine for running in the garden like that but whee have done lots of jubilee things which whee enjoyed.